Since taking ownership of Sheboygan Armature Works from Dale and Dave Kautzer and launching Acme Armature Works Inc. last September, the past 12 months have been filled with a whirlwind of activity for owner Chad Bahrs and his skilled staff of electro-mechanical motor repair specialists. One of Bahrs’ top priorities in the first year involved upgrading the shop with new equipment to make Acme Armature Works Inc. more self-sufficient in all phases of electric and servo motor repair. 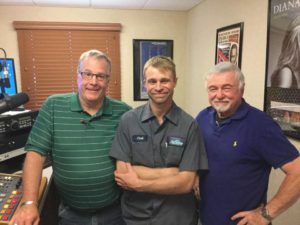 Acme Armature Works Inc. owner Chad Bahrs (middle) appeared on The Biz Connection Radio Show with hosts Ron Nielsen (left) and Jim Rosetti (right) in July. Association) accreditation over the course of the past year. The shop also earned Recommended Practice for the Repair of Rotating Electrical Apparatus (ANSI/EASA AR100-2015) certification in 2017. An open house and Sheboygan County Chamber of Commerce ribbon cutting event on June 1 served as an official welcome to the community for Bahrs and his staff, who conducted tours of the upgraded Acme shop for current and prospective customers. In July, Bahrs was featured as a guest on The Biz Connection Radio Show, which gave him an opportunity to share his story of business ownership with a statewide listening audience. Bahrs also finalized a partnership with Outstrip Equipment to build parts for the company’s Eon, Neo and Helix fitness machines, which will be further revealed in the near future. Bahrs has been pleased with the support Acme Armature Works Inc. has received in its first year and looks forward to the road ahead. For more information or to request service with Acme Armature Works Inc., email info@acmearmature.com, call the 24-hour service line at 920-452-3389 or visit www.acmearmature.com. Career opportunities abound at Acme Armature Works Inc. Call Acme Armature Works for your industrial motor needs. 8:00 - 5 :00 p.m.